Certificates of deposit. If you have a large cushion, it’s quite likely to just sit there for years. Why not put some money in longer-term investments where you can still take it out in a true emergency and pay an early withdrawal penalty. Synchrony Bank (formerly GE Capital Retail Bank) is offering a 5-year CD paying 2.30% APY for $25k+ balances (2.25% APY for $2k+) with an early withdrawal penalty of 180 days interest. For example, if you withdraw from this CD after 2 years and pay the penalty, your effective rate earned will still be 1.72%. Ally Bank Online Savings paying 0.90% APY (as of 11/3/14) which also serves as a no-fee overdraft option to my Ally Interest Checking, that way I can keep a minimal balance in checking. Ally checking also has unlimited ATM fee rebates and no fees. I know there are some savings accounts paying a tiny bit more, but not worth the trouble for less than 0.1% difference on $10,000. Ally Bank CDs earning between 1.84% and 3.09% APY. These are old 5-year CDs with a short 60-day interest penalty. Current Ally CD rate of 11/3/14 is 2.00% APY for 5-Year CD with 150-day early withdrawal penalty. All rates are believed current as of writing, 11/3/14. Update: The official announcement states that effective November 1st, the new fixed rate on Series I savings bonds is 0.0%, down from the previous 0.1%. The variable inflation-indexed rate is 1.48% (as was predicted). Thus, buying a new I Bond between November 2014 through April 2015 will earn a composite rate of 1.48% for the first six months, and after that 0% the current inflation-indexed rate updated every 6 months. March 2014 CPI-U was 236.293. September 2014 CPI-U was 238.031, for a semi-annual increase of 0.74%. Using the official formula, the variable component of interest rate for the next 6 month cycle will be approximately 1.48%. The new fixed rate won’t be announced until November 1st (speculation below). 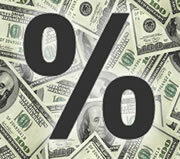 You add the fixed and variable rates to get the total interest rate. If you have an older savings bond, your fixed rate may be different. The annual purchase limit is now $10,000 in online I-bonds per Social Security Number. For a couple, that’s $20,000 per year. Buy online at TreasuryDirect.gov, after making sure you’re okay with their security protocols and user-friendliness. You can also buy an additional $5,000 in paper bonds using your tax refund with IRS Form 8888. If you have children, you may be able to buy additional savings bonds by using a minor’s Social Security Number.